The Agenda for Shared Prosperity's central aim is to articulate policy options that will spur growth, reduce economic insecurity, and provide broadly shared prosperity. A central component of achieving individual economic opportunity is ensuring that the economy is growing at a solid pace—both by smoothing the short-term dips and by promoting investments for long-term growth. 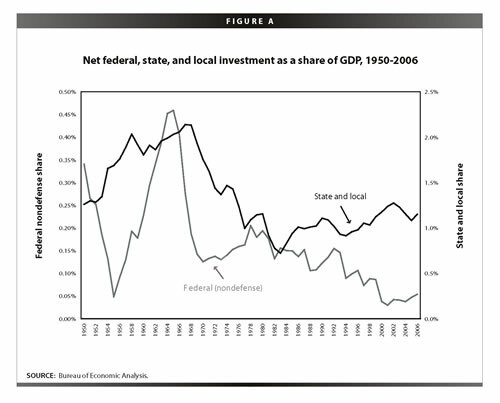 Public investments in the nation's infrastructure, which lay the foundation for long-term growth, have been insufficient in recent years. Visible catastrophic failures are evident in the breach of the levies in New Orleans, the collapse of a major bridge in Minneapolis, and power blackouts that flowed from the Mid-West to New York City. Less visible failures are evident in the slow seepage of sewers into our waterways and in the slow deployment of broadband Internet access. In a time of economic weakness, public investments in the nation's infrastructure can provide short-term stimulus and build the foundation for long-term economic growth. Federal investments in infrastructure, including transportation, school buildings, and information networks, are required to address critical national needs and to create jobs and spur the economy. While federal rebates set to arrive this summer will provide some boost to consumer spending, other simulative policies should be set in motion to ensure against prolonged weakness. EPI's Strategy for Economic Rebound highlighted the role that accelerated federal investments in priority areas—including bridges, roads, schools, and environmental infrastructure—could play in stimulating the economy in the short-run. One complement to the current rebate policy is to put Americans to work building or repairing needed capital assets as suggested below. This work puts money in the pockets of those workers immediately, and it can lead to higher productivity in the future. The economic activity and jobs directly created by this spending also have a beneficial multiplier effect as the additional money ripples throughout the economy. Timing is important: investments for the purpose of short-tem stimulus can emphasize repairs in which the work can start and be completed quickly. However, unemployment will probably continue to rise in 2009, and the need for stimulus will continue as well. With gas and oil prices climbing to record highs, it is more important than ever to build a transportation infrastructure that is efficient at getting people to their destination. With the need to reduce carbon emissions, our modes of transportation will likely have to change significantly, yet the current system is already over stressed. The need to move toward energy independence and to combat global warming poses significant challenges for transportation infrastructure. Most efforts to curb energy use and greenhouse gas emissions have focused on transportation technologies, by, for example, modifying the required vehicle fuel standards or by subsidizing hybrid technology. However, the role of infrastructure cannot be ignored. In addition to reducing congestion (see above), steps can be taken to effectively plan urban development to reduce commute times and energy usage. For example, investments in light-rail and other forms of municipal mass transit can simultaneously reduce congestion, energy usage, and commute times. Other modes of transportation are under stress as well. In Washington, D.C., for example, subway ridership is expected to increase by 42% over the next 25 years, necessitating a purchase of 220 new cars to ensure it can handle the excess capacity.6 Other localities are facing similar challenges. The federal government has traditionally played a strong role in financing transportation projects in partnership with state and local governments. The obvious importance of the transportation infrastructure to the nation's economy requires a renewed emphasis on developing a comprehensive strategy, not just a project-by-project approach to federal funding. Estimates of the effects of construction spending vary: the Federal Highway Administration estimates that every $1 billion spent on transportation infrastructure creates 47,000 jobs (or more) and up to $6 billion in additional gross domestic product. With the housing market in decline, construction employment fell by more than 360,000 jobs since March 2007, leaving a ready labor force to begin new projects. High-quality drinking water is critical to promoting human health, and wastewater treatment is essential in protecting the environment. There are 772 communities in 33 states and the District of Columbia with a total of 9,471 identified combined sewer overflow problems.7 Sewer overflows release approximately 850 billion gallons of raw or partially treated sewage annually into our rivers, lakes, and wetlands. In addition, the Environmental Protection Agency (EPA) estimates that between 23,000 and 75,000 sanitary sewer overflows occur each year in the United States, releasing between three to 10 billion gallons of sewage per year. The EPA estimates that more than $50.6 billion is necessary to address combined sewer overflow problems, and an additional $88.5 billion is needed to address sanitary sewer overflows. Investing in sewer replacement would help prevent future spills as well as underground erosion that can threaten building structures. Maintaining this stock is expensive. Public K-12 schools throughout the nation need to spend an estimated $17 billion a year to maintain existing structures and grounds.10 And there is evidence that many schools are falling behind. According to an NCES survey in 1999, 76% of all schools reported that they had deferred maintenance of their buildings and needed additional funding to bring them up to standard. The total deferred maintenance exceeded $100 billion, an estimate in line with earlier findings by the Government Accounting Office (GAO). In New York City alone, officials have identified $1.7 billion of deferred maintenance projects on 800 city school buildings. The American Society of Civil Engineers in 1998 gave public school infrastructure a grade of "F." By 2005, schools raised their grade to a "D."
While most school funding is at the local and state levels, the federal government can play an important role in stimulating school investment. This spending is important because a well-educated national workforce is essential to maintaining a growing economy in the global marketplace—we cannot continue to tell our children that education is essential while at the same time allowing our schools to crumble. As suggested by a new report for EPI's Agenda for Shared Prosperity, closing the maintenance and repair gaps—through a $20 billion one-time federal contribution—would allow schools to improve student health, help retain teachers, and improve the quality of teaching and learning, while at the same time generating close to 250,000 jobs. Looking farther out, the United States should reduce the disparity of building quality across school districts by, in part, establishing a federal commitment to school districts in low-income communities. Matching the 10% the federal government pays for operating expenses with a 10% national share of capital outlays would infuse nearly $6 billion a year into school building funds. Further, by making energy-saving and "green" building a priority, school districts could save money that they would otherwise spend on energy costs, allowing them to spend more on teachers, books, and computers. As the United States moves into a 21st century information age, the nation needs to take a broader view of the kinds of infrastructure that are important for the economy. In the past, market commerce was conducted primarily by physical roads; in the future, telecommunications will play an increasingly important role in creating products and marketplaces. Access to a well-developed information infrastructure is critical to future economic growth and to full participation in the modern economy. Ebay and Amazon.com are the most obvious of the new electronic markets, but there are many other examples of the growing networked economy—computer software and development services are conducted remotely; banking is done increasingly online; and online presence is growing more intertwined with "real" life.11 Low-income Americans who do not have access to the Internet are increasingly at a disadvantage, whether it comes to job hunting or bargain hunting—or simply keeping up with mainstream culture. Unfortunately the United States has fallen behind in the development of this critical infrastructure, and more needs to be done to 1) ensure affordable access, and 2) improve the quality and reliability of the nation's Internet. The example of broadband Internet access is illustrative of the need to upgrade the U.S. information infrastructure. The United States currently ranks 15th of 30 developed countries in overall broadband penetration as measured by the Organization for Economic Cooperation and Development.12 Nations that have prioritized broadband infrastructure have already seen improvements. For example, Denmark's broadband penetration reached 34 connections per 100 inhabitants in 2007, while the United States had just 22 per 100. Expanding broadband infrastructure in the United States would not simply improve the speed of our connections for entertainment purposes, but it would also bring a wealth of knowledge to more citizens in more areas. With greater reach, the United States could see improvements in education, health care, and first-responder capabilities as communications become faster, more efficient, and more effective. More extensive broadband might also allow for greater telecommuting and teleconferencing, and thus also help to reduce travel and energy demands. The United States has also fallen behind in the deployment of new broadband technologies. Fiber optic broadband has been blended into the telecomm systems of Japan, South Korea, and other countries, giving them a huge lead in this newest, fastest connection: over 35% of Japan's Internet connections are fiber optic whereas only 3% of U.S. connections are. This failure to lead in broadband expansion has consequences beyond the narrowly economic. Internet connectivity is becoming increasingly important for national security, responding to natural disasters, health care communications, and educational uses. augmenting universal service programs to incorporate the support of broadband in high-cost and underserved areas. In addition to upgrading Internet connections, the federal government should make strides in providing online content. It collects a variety of useful information, ranging from economic statistics, to securities data, to toxic chemical inventories. This information should be made available for public viewing and analysis. The creation of derivative works and research add to the stock of public knowledge. In recent years state and local governments have looked to finance public infrastructure spending by a variety of non-traditional methods. For example, several governmental agencies have investigated public/private partnerships (or outright privatization) to increase the amount of resources available for transportation projects, in particular the construction (or sale) of toll roads. Such transactions should be evaluated with caution to ensure that the public interest is being served, that private partners do not receive windfall profits from the agreements, and that public officials can maintain future policy flexibility—for example, to ensure that they are not "locked-in" to certain transportation and land-use policies for an excessive period of time. At the same time, there have also been proposals at the national level to create infrastructure investment banks designed to improve or enhance the financing streams of infrastructure projects as well as to place the project selection process under more independent management. Under one such proposal by Senators Christopher Dodd and Chuck Hagel, an investment bank would make loans or loan guarantees to non-federal governments to pursue infrastructure projects—including transit, public housing, roads and bridges, and water projects—based on ratings by the bank's staff. This national infrastructure bank would 1.) designate qualified transit, public housing, water, highway, bridge, or road infrastructure projects for loans, loan guarantees, and other financial assistance; and 2.) issue general purpose and project-based infrastructure bonds exempt from state and local taxation. By backing the project's financing with federal guarantees, the program would lower the financing costs and increase access to funds by states and localities, and thus spur additional infrastructure spending. Additional strategic public investments in national infrastructure—including transportation, education, and information—would both spur the economy in the short-run and increase the economy's productive capacity in the long-run. National policies can address these infrastructure needs in a variety of ways, including through additional direct funding, the provision of grants and loan guarantees to states, and the support of technological innovation. The sooner these investments are made, the sooner the economy will start reaping the rewards. 2. One widely held concern about including spending in a stimulus package is that there will be delays and the economic benefits will come too late to help offset the rising unemployment. However, there are many areas of needed public investment where projects with completed plans are already identified—the only element missing is the funding. This is especially true when examining repairs to existing infrastructure, where the projects can be undertaken as well as completed relatively quickly. last accesses April 21, 2008. 8. M. Filardo, Good Buildings, Better Schools: An Economic Stimulus Opportunity With Long-Term Benefits, EPI April 2008. 9. See National Center for Educational Statistics, "Condition of America's Public School Facilities: 1999,"
10. Lawrence Mishel, Ross Eisenbrey, and John Irons, Strategy for Economic Rebound, EPI BP#210, January 2008, at http://www.epi.org/content.cfm/bp210. 11. The online world SecondLife logged-in over 735,000 "residents" in the month proceeding April 20th, and recorded a total of over 19 million monetary transactions in March alone. to make public information available via the Internet.